The University of Evansville will hold a 40th Anniversary Commemoration of the 1977 Plane Crash on Wednesday, December 13 at 7:00 p.m. The ceremony will be held at Memorial Plaza on the UE campus. The Air Indiana Flight 216 crashed at 7:22 p.m. on the evening of December 13, 1977 carrying the University of Evansville basketball team along with coaches, administrators, and fans. Those gathered will observe a moment of silence at that time during the candlelight vigil. The order of service will include candle lighting, a reading of the names of those who perished in the plane crash, and a bell ringing during each interval. University of Evansville President Thomas A. Kazee will provide a statement, followed by the singing of the UE alma mater, prayers, and bagpipes. An opportunity for informal gathering and fellowship will be offered in Ridgway University Center’s 1959 Gallery and Lounge immediately following the ceremony. Neu Chapel will also be open for personal prayer and meditation throughout the evening. The public is invited to attend this commemoration and the University of Evansville is working to personally reach families of those who perished. A Facebook event has also been created for interested guests to stay up to date with information. Visit www.facebook.com/UniversityofEvansville to find the event. Additionally, a memorial service to honor the first responders involved in this tragedy will be held at Oak Hill Cemetery at 11:00 a.m. on the same day. Mr. and Mrs. Steve Dabrowski will be joining us today at the Newman Center to discuss compassion in fighting for the right to life and immigration. All are welcome and dinner will be provided! Standing at 5-1 following a successful trip to the Cancun Challenge, the University of Evansville men’s basketball team heads to New Mexico for a match-up against the Lobos this evening. After going 1-1 on the trip to Mexico, the Purple Aces stand at 5-1, a start they are enjoying for the fourth time in five years. In the win over Fresno State, Ryan Taylor scored 21 points and hit the game-winner before totaling 11 against Louisiana Tech. Taylor suffered a fractured foot in the opener against Fresno and could miss up to six weeks of play. With 21.3 points per game, Taylor is third in the MVC and 36th in the country. Wednesday’s game will mark the sixth for UE in the MVC/Mountain West Challenge, Evansville is 2-3 in the series, but has won the last two games. Dainius Chatkevicius averaged 7.0 points and 7.5 rebounds in the two games played in Mexico. After registering four points and seven rebounds against Fresno State, Chavkevicius had 10 points, all in the second half, against La. Tech while grabbing 8 boards. In his first contest at Evansville, Chatkevicius posted 10 points, 6 rebounds and 3 blocks; his block total led the team. In a 3-game stretch entering the trip to Cancun, Dru Smith dished out a total of 29 assists. His average of 6.0 leads the MVC and is 26th in the nation. He is also shooting a slick 62.9% through the opening six outings. Smith has tallied double figures in four games this season after doing so just four times in his whole freshman campaign. New Mexico enters Wednesday’s game with a 2-4 mark and have dropped their last four contests. In the weekend Emerald Coast Classic, the Lobos fell to TCU and Maryland. Three players have averaged double figures led by Chris McNeal, who has posted 17.2 points per game while Sam Logwood and Anthony Mattis stand at 16.0 and 10.3 PPG, respectively. This will be the first meeting between the schools on the hardwood. Fireside Chat at Honey Moon Coffee Co.
All are invited to join this week's Fireside Chat as we continue our series, "Life's Maze, God's Mission, and Me: What is God Calling Me to Do?" We will consider together what it takes to accomplish our goals, both the good and the bad, and what we do once they are accomplished. We will meet in Grabill Lounge, the basement of Neu Chapel, this evening at 7:30 and will walk over to Honey Moon Coffee Co. together! Please join us at 7:00 pm tonight, upstairs in Ridgway University Center, to see a presentation on Qatar. We hope you can make it! Everyone is invited to join the Neu Chapel community for our last University Worship service for the fall semester this Sunday at 11:00 a.m. We will sing festive, seasonal music and give thanks for God's goodness shown to us over the course of this semester. We will also consider how our striving for peace involves inward change and growth. Join us for this exciting service, and as always, donuts, and coffee will be provided before and after the service. Catholic Mass will be held tonight in Neu Chapel with Adoration beginning at 7:00 p.m. and Mass from 8:00-8:30 p.m. All students are welcome to come relax and celebrate with us! The University of Evansville women's basketball team will hold the Teddy Bear Toss on December 10 when the Purple Aces host Morehead State at 7:00 p.m. in Meeks Family Fieldhouse. Benefiting the Arc of Evansville Child Life Center, fans are encouraged to bring a new and unused teddy bear or stuffed animal to toss during halftime of the contest. Each stuffed animal will be given to a child at the Child Life Center. The fan who tosses their teddy bear closest to center court will win a Purple Aces prize pack including vouchers to a future basketball game. Fans who bring a teddy bear or stuffed animal to the game will receive $3 tickets to the game for everyone in their party. The Child Life Center (CLC) provides high-quality programs in an inclusive environment for children ages six weeks to six years, both with and without disabilities, by nurturing their social, emotional, physical, and intellectual growth. The state-licensed facility is accredited by the National Association for the Education of Young Children (NAEYC) and rated Level 4 on the Paths to Quality program. Last year, 59% of the children who exited the CLC and entered kindergarten reduced or eliminated their need for special education services. Celebrate the season at Christmas on Campus with photos with Purple Santa, Candlelight Vespers, and more. Learn more and register at www.evansvlle.edu/aceschristmas. Events are FREE for students, just show your UE ID. Faculty, staff, administrators, alumni, guests, community members and friends of the University are welcome to any and all events! Only $5 per family or $2 per person! Includes Photos with Santa, Reindeer Games, Trackless Train Rides, Carriage Rides, ticket for roasted nuts, cookies and hot chocolate. No charge for the Candlelight Advent Vespers service or Christmas Tree Lighting. 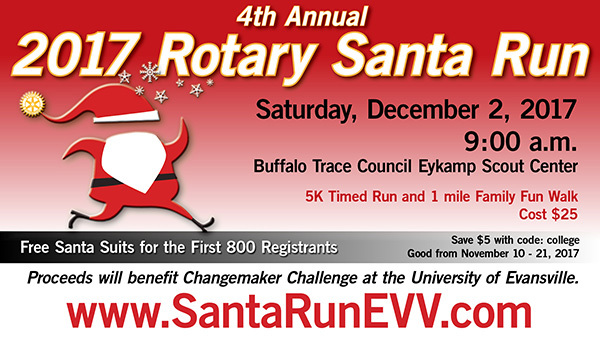 Fill out the online registration form to save time during the event. Stop in for giveaways and 15% off the original price of all clothing and gift items to all shoppers during the night! BiSci Club is sponsoring a talk by Caitlyn Ricks, an alumn of the biology department here at UE. She will be coming to give a talk about genetic counseling today - Thursday, November 30 - from 7-8 p.m. in KC 101. Please consider coming to hear her talk about her program and what all it has to offer. If you plan on attending please RSVP through the link below. There will be pizza served. Then afterward if you would like you can stick around for the BiSci Christmas movie night. Calling on all UE campus trumpeters. The 3rd Annual Tannenbaum Trumpets will perform for the UE Tree Lighting on Friday, December 1, in front of Graves Hall immediately following Vespers. Anyone one wanting to participate in Tannenabaum Trumpets (a community based trumpet ensemble) should contact Tim Zifer, professor of music, at tz3@evansville.edu. There will be a short rehearsal on Friday, December 1 at 7:00 p.m. in Room 100 in the Krannert Hall of Fine Arts. 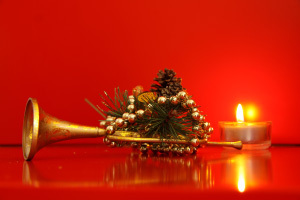 Get your holiday on by performing with the Tannenbaum Trumpets! Students who have used federal direct (subsidized/unsubsidized) loans and plan to graduate in the fall (or transfer after the fall semester) are required to attend a loan repayment counseling session. The Office of Financial Aid will hold the last session of the semester on Thursday, December 7 (Reading/Study Day) at 2:00 p.m. in Eykamp Hall, Room 252, Ridgway University Center. All UE faculty, staff and administrators may now begin claiming their two complimentary tickets to the men's basketball game at the Ford Center at 1:00 p.m. against Oakland City this Saturday, December 2. Valid UE ID is required. Go Aces! Want to be an OL but studying abroad in spring 2018? If you are studying abroad in Spring 2018 and you would like to submit an application for an orientation leader (OL) position, please stop by Ridgway University Center, Room 230 (Dean of Students’ office) for an application packet now. Applications will be accepted until December 4. An interview will be conducted prior to your leaving the country. Questions can be referred to the dean's office at 812-488-2500 during business hours. Students who will not be studying abroad in the spring will apply during the normal application period which will be announced in AceNotes soon. The Newman Club will be offering a 20 minute rosary prayer every Wednesday at 10:00 a.m. in Library Room 209. Students and faculty are welcome. For more information, contact Olivia at ov4@evansville.edu. University of Evansville student Maggie Phelps of Alexandria, Indiana, was one of 30 students from Indiana’s private, non-profit colleges and universities honored recently at the 28th annual Realizing the Dream Banquet. The event recognizes first-generation students attending Independent Colleges of Indiana campuses, along with their inspirational teachers and families. Realizing the Dream is made possible by a grant from Lilly Endowment Inc. to the ICI. The students honored at the event have realized the dream of being the first in their families to go to college, have been selected by their colleges for outstanding achievement in the freshman year, and are successfully advancing toward completing their bachelor’s degrees. Each student will receive a $2,500 check to help with college costs, and each student’s selected “most influential” teacher/mentor will receive a $1,000 professional development grant. Phelps’s most influential teacher is Deborah Selke, an instructor at Alexandria-Monroe High School in Alexandria. One out of every three students on ICI campuses is first-generation. Generous financial aid provided by the institutions, combined with state and federal grants, makes a private college education possible for all students in Indiana. The University of Evansville has received distinctions for being military student friendly by Military Times, MAE&T, Military Friendly Schools, and U.S. News and World Report. Most recently, UE was recognized in the Military Times Best: Colleges 2018 rankings. Fewer than half of the 600 colleges that applied for this list were accepted. UE ranked at 139 on the list. The Best College rankings, formerly known as Best for Vets, are based on the Military Times’s annual survey, the most comprehensive school-by-school assessment of veteran and military student services and rates of academic achievement. An editorially independent news project, Best Colleges evaluates factors that help make colleges and universities a good fit for service members, military veterans, and their families. This survey is the most comprehensive school-by-school assessment of veteran and military student services and rates of academic achievement. A record number of schools responded to this year’s survey. Sixty-seven percent of the responding schools were public, approximately 23 percent were private, and seven percent were for-profit. Eighty percent of the schools that made the list were public, 17 percent were private, and 3 percent were for-profit. "Of the hundreds of schools that applied, only the best made the cut," said George Altman, Military Times editor in charge of the rankings. "For the past eight years, we've seen colleges and universities consistently increasing their resources, revising policies and improving academic outcomes for military and veteran students. The Military Times Best: Colleges rankings showcase the very best of these efforts." Military Times’s annual Best Colleges survey asks universities to meticulously document a tremendous array of services, special rules, accommodations, and financial incentives offered to students with military ties; and to describe many aspects of veteran culture on a campus. Military Times factors in data from the Veterans Affairs and Defense departments and three Education Department sources: the IPEDS Data Center, College Scorecard data and the Cohort Default Rate Database. In addition to this favorable ranking from Military Times, the University of Evansville was also recently ranked 8th for Best for Veterans Regional Universities Midwest by U.S. News & World Report, a Top School in the 2018 Military Advanced Education & Transition (MAE&T) Guide to College and Universities, and a 2018 Silver Award recipient by Military Friendly Schools.